It’s that time of the year again where Australians are busy digging out all kinds of paperwork to get their taxation done, for better or worse. Luckily, if you’re an AWB customer, you won’t need to scrounge around to find your Recipient Created Tax Invoices (RCTI). All our RCTIs are sent to you on the same day the payment is made by your preferred delivery method, be that by mail, email or fax. However, did you know that you can also access your AWB RCTIs on demand? From within our AWB customer portal, you can view and download copies of your RCTIs in PDF format or even as a CSV file which you can uploaded into your accounting software, such as Agrimaster, or you can provide to your accountant in generic format. To make it even simpler, you can even provide your accountant access to view your RCTIs and payment summaries. Click here to see how you can give this access to your accountant. As part of trying to make things easier for you, our RCTIs are very easy to read and follow a simple structure for all payment types. 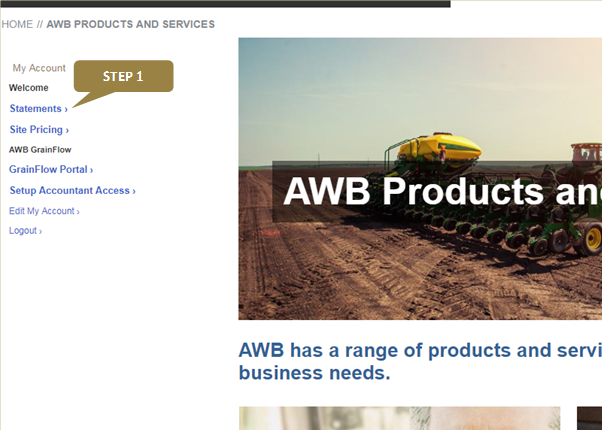 To get started, you must login through the AWB customer portal. You can access that here. Step 1: Once logged in, click on ‘statements’. Step 2: Choose the applicable NGR that you want to view statements for and click ‘view statements’. Step 3: Select all line items associated with a date of payment to see all RCTI related information for those payment dates. Step 4: Then simply click ‘view’ and the selected RCTI related information should appear in a new browser tab. ALTERNATIVE STEP 4: Alternatively, if you or your accountant is after the csv file of an RCTI, simply click ‘download data’ to choose which csv format you’re after and then confirm. The file should be immediately available after confirmation. If you think you’ve encountered some issues or are still unclear on how to access your RCTI information, call AWB on 1800 447 246 and our team will happily assist with resolving your issue or to walk you through step by step in getting access to your RCTI information. AWB today are pleased to announce and congratulate the winners of the 2018 AWB National Crop Survey prize draw. There is a long list of things that can influence a successful wheat marketing strategy. But six key factors are essential according to Erik and Peter from Cargill. AWB today are pleased to announce a 2017/18 Harvest Pool estimated pool return for the 30th June 2018.